We start with the oldest challenge in the economics of nutrition, with the dish that best contributes to a least-cost diet. We also have a prize for meeting nutrient requirements with the least environmental impact, and another for meeting your RDAs with the most cultural significance. And, lest we forget life’s most implacable constraint, a prize for doing so with the least preparation time. We had serious economists judging the contest, Sean Cash and Anna McAlister, but very unserious prizes: what my wife Diane calls the universal food. 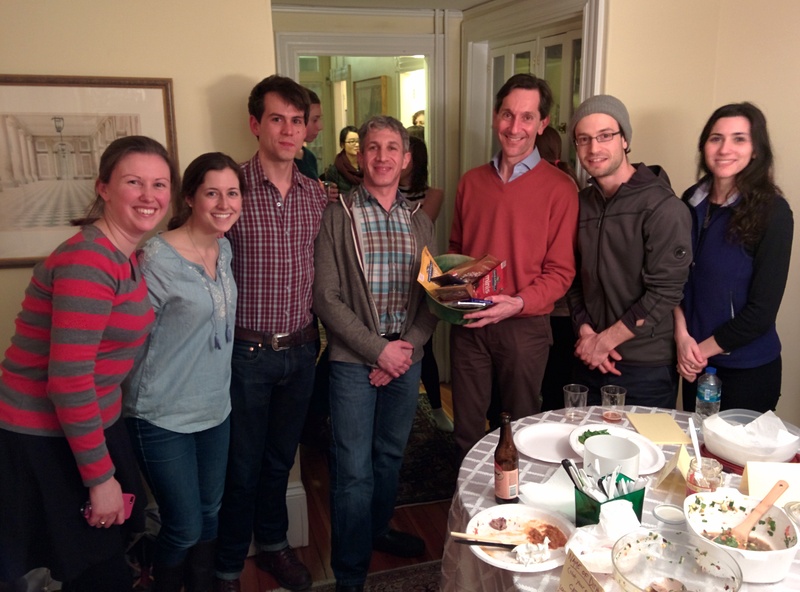 Here are the winners: From left, Anna (judge), Krista Zillmer (for a spectacular Spaghetti Squash Chow Mein) , Quinault Childs (for delicious cricket-flour cookies), Sean and me (with prizes), Aaron Shier (bowing to Milky Way Day) and Kristen Caiafa (for a bag of what is really, truly the global standard in least-cost nutrition). Of course we also had many other wonderful dishes, from Iyamide’s Sierra Leonean stew to Ashley’s classic carrot cake. As you can see from the detritus on the table, we ate it all. PS: NUTR 238 alumni can check out past potluck photos here.